We are an intimate, boutique fitness studio specializing in teaching intimidating yoga asanas/positions in a supportive, and judgment-free environment. Some of these asanas include Adho Mukha Vrksasana, (the handstand), and Hanumanasana, (the front splits). We also incorporate the art of pole dancing and aerial hoop performance. Both of these apparatuses create new, fun challenges for the body and mind, and our studio fosters an intimate, body-positive experience for all students. We love working with absolute beginners who are willing to dedicate themselves to regular practice. We also welcome drop-in students who are curious or just interested in occasional practice, as well as intermediate and advanced students, and those who just don’t enjoy monotonous gym workouts. We ask students who are starting out to choose one apparatus introductory class, e.g. Pole or Aerial Hoop. It helps to do some research online – YouTube, social media, etc. - about the apparatus to have a bit of a working knowledge when you come in. After your intro class, if you like the apparatus and would like to explore it more, we have a three-month unlimited program that you can sign up for. At that point, if exploring different classes still interests you, feel free to do so! A new apparatus can be quite challenging for students. This is why we recommend an introductory class before committing to a three-month membership. The introductory class is 30 or 45 minutes long. These classes are very small (between 1-4 students) and very affordable – only $20 per class. The introductory classes are for those new to fitness, yoga, pole dancing, aerial hoop or, those who just want to sample a bit of what we offer. There’s no heavy pressure sales pitch afterwards. As a matter of fact, feel free to take photos or videos so you can remember how much fun you had! Introductory classes are held Monday-Friday at 6pm. Click Here to View Schedule! We encourage students to build a strong foundation with Ground Classes such as our cornerstone yoga-inspired class, Find My Handstand, and Flexibility. These classes incorporate work on the mind and the entire body. 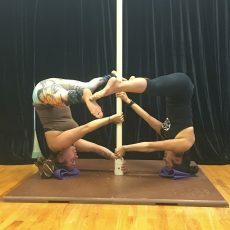 Our coaches at Yoga Pole Studio can take any person who is dedicated, disciplined, and determined to master a handstand with consistent, regular class attendance. Our 360 formula, which includes unlimited access to the Ground Classes in addition to the aerial classes, helps to simplify the workout regimen to maintain a healthy body and mind. Every student is unique; some need three introductory lessons, and some are ready to take the full-length class after just one. If you’re unsure, feel free to call us. 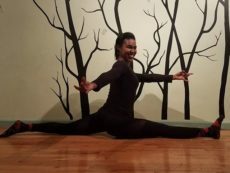 New to Yoga Pole Studio? Introduce Yourself!